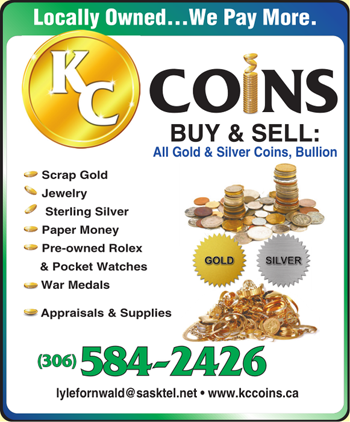 KC Coins in Regina buys and sells precious metals, including silver and gold coins, scrap gold, and jewelry. Our staff has a unique knowledge of war metals, pocket watches, and pre-owned Rolexes. Since 2006, we’ve been working with coin collectors in Saskatchewan to get them the best market prices for their precious metals. If you’re looking for new jewelry, pocket watches, or currency to add to your collection, we have an inventory of items for sale as well. KC Coins is your source to for getting a good price for jewelry you no longer need or broken items. Our jewelry experts will appraise your items so you know how much they’re worth. Our store has a wealth of information about all types of coins and precious metals. Get the cash or new jewelry you need at our Regina coin shop. We accept Visa or MasterCard for purchases over the phone. Shipping and handling costs will be $15 for most items within Canada. We will give an exact cost when purchasing an item. Please call, text, or email for availability and special pricing.